Three houses for the Wanner Land Co for sale or rent in Eldora. Lewis Ave - Large four-room house, Lewis Avenue - Large five-room house, Albert Avenue - Eight-room reception hall house. A $10 bill secures any lot on the Plan. No taxes or interest 'till you get your deed. Every purchaser is entitled to a chance to get a free lot. Lots $115 to $250. Ten more new houses under construction. Adjoins Eldora Park and overlooks Monessen. 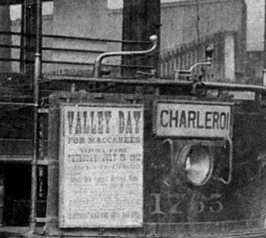 Pittsburgh and Charleroi cars run through the plan. $50 to $250. Terms of sale $10 down, $5 and $10 monthly, no taxes or interest until 1907. Wanner Land Co. J. M. Wanner, Mgr. Saturday, August 12, 1905. Anyone buying a lot and paying 20 per cent of its purchase price is entitled to a ticket. 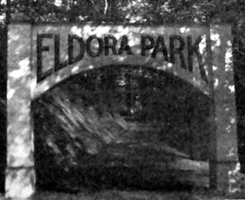 Take Pittsburg and Charleroi Street Car get off at Wanner Avenue and go to Eldora Land Office. Thursday, July 25, 1912. Sign on front of open summery trolley number 1765.